Hydrogen ( IPA: /ˈhaɪdrə(ʊ)dʒən/, Latin: 'hydrogenium', from Ancient Greek ὕδωρ (hudor): "water" and Ancient Greek γείνομαι (geinomai): "to beget or sire") is a chemical element that, in the periodic table, has the symbol H and an atomic number of 1. At standard temperature and pressure it is a colorless, odorless, nonmetallic, tasteless, highly flammable diatomic gas (H2). With an atomic mass of 1.00794 g/ mol, hydrogen is the lightest element. It is also the most abundant, constituting roughly 75% of the universe's elemental mass. Stars in the main sequence are mainly composed of hydrogen in its plasma state. Elemental hydrogen is relatively rare on Earth, and is industrially produced from hydrocarbons, after which most free hydrogen is used "captively" (meaning locally at the production site), with the largest markets about equally divided between fossil fuel upgrading (e.g., hydrocracking) and in ammonia production (mostly for the fertilizer market). However, hydrogen can easily be produced from water using the process of electrolysis. The most common naturally occurring isotope of hydrogen has a single proton and no neutrons. In ionic compounds it can take on either a positive charge (becoming a cation composed of a bare proton) or a negative charge (becoming an anion known as a hydride). Hydrogen can form compounds with most elements and is present in water and most organic compounds. It plays a particularly important role in acid-base chemistry, in which many reactions involve the exchange of protons between soluble molecules. As the only neutral atom for which the Schrödinger equation can be solved analytically, study of the energetics and bonding of the hydrogen atom has played a key role in the development of quantum mechanics. the name of an element. an atom, sometimes called "H dot", that is abundant in space but essentially absent on earth, because it dimerizes. a diatomic molecule that occurs naturally in trace amounts in the Earth's atmosphere; chemists increasingly refer to H2 as dihydrogen to distinguish this molecule from atomic hydrogen and hydrogen found in other compounds. the atomic constituent within all organic compounds, water, and many other chemical compounds. The elemental forms of hydrogen should not be confused with hydrogen as it appears in chemical compounds. Hydrogen gas, H2, was first artificially produced and formally described by T. von Hohenheim (also known as Paracelsus, 1493– 1541) via the mixing of metals with strong acids. He was unaware that the flammable gas produced by this chemical reaction was a new chemical element. In 1671, Robert Boyle rediscovered and described the reaction between iron filings and dilute acids, which results in the production of hydrogen gas. In 1766, Henry Cavendish was the first to recognize hydrogen gas as a discrete substance, by identifying the gas from a metal-acid reaction as "inflammable air", and further finding that the gas produces water when burned. Cavendish had stumbled on hydrogen when experimenting with acids and mercury. Although he wrongly assumed that hydrogen was a liberated component of the mercury rather than the acid, he was still able to accurately describe several key properties of hydrogen. He is usually given credit for its discovery as an element. In 1783, Antoine Lavoisier gave the element the name of hydrogen when he (with Laplace) reproduced Cavendish's finding that water is produced when hydrogen is burned. Lavoisier's name for the gas won out. One of the first uses of H2 was for balloons. The H2 was obtained by reacting sulphuric acid and metallic iron. 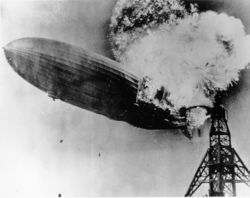 Infamously, H2 was used in the Hindenburg airship that was destroyed in a midair fire. One of the first quantum effects to be explicitly noticed (but not understood at the time) was Maxwell's observation, half a century before full quantum mechanical theory arrived. He observed that the specific heat capacity of H2 unaccountably departs from that of a diatomic gas below room temperature and begins to increasingly resemble that of a monatomic gas at cryogenic temperatures. According to quantum theory, this behaviour arises from the spacing of the (quantized) rotational energy levels, which are particularly wide-spaced in H2 because of its low mass. These widely spaced levels inhibit equal partition of heat energy into rotational motion in hydrogen at low temperatures. Diatomic gases composed of heavier atoms do not have such widely spaced levels and do not exhibit the same effect. Hydrogen is the most abundant element in the universe, making up 75% of normal matter by mass and over 90% by number of atoms. This element is found in great abundance in stars and gas giant planets. 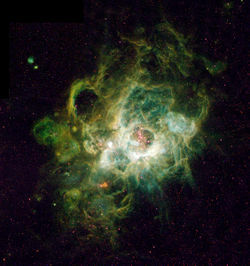 Molecular clouds of H2 are associated with star formation. Hydrogen plays a vital role in powering stars through proton-proton reaction nuclear fusion. Under ordinary conditions on Earth, elemental hydrogen exists as the diatomic gas, H2 (for data see table). However, hydrogen gas is very rare in the Earth's atmosphere (1 ppm by volume) because of its light weight, which enables it to escape from Earth's gravity more easily than heavier gases. Although H atoms and H2 molecules are abundant in interstellar space, they are difficult to generate, concentrate, and purify on Earth. Most of the Earth's hydrogen is in the form of chemical compounds such as hydrocarbons and water. Hydrogen gas is produced by some bacteria and algae and is a natural component of flatus. Methane is a hydrogen source of increasing importance. The ground state energy level of the electron in a hydrogen atom is 13.6 eV, which is equivalent to an ultraviolet photon of roughly 92 nm. The energy levels of hydrogen can be calculated fairly accurately using the Bohr model of the atom, which conceptualizes the electron as "orbiting" the proton in analogy to the Earth's orbit of the sun. However, the electromagnetic force attracts electrons and protons to one another, while planets and celestial objects are attracted to each other by gravity. Because of the discretization of angular momentum postulated in early quantum mechanics by Bohr, the electron in the Bohr model can only occupy certain allowed distances from the proton, and therefore only certain allowed energies. 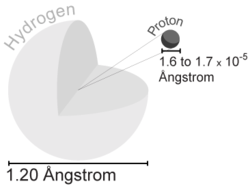 A more accurate description of the hydrogen atom comes from a purely quantum mechanical treatment that uses the Schrödinger equation to calculate the probability density of the electron around the proton. Treating the electron as a matter wave reproduces chemical results such as shape of the hydrogen atom more naturally than the particle-based Bohr model, although the energy and spectral results are the same. Modeling the system fully using the reduced mass of nucleus and electron (as one would do in the two-body problem in celestial mechanics) yields an even better formula for the hydrogen spectra, and also the correct spectral shifts for the isotopes deuterium and tritium. 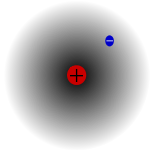 Very small adjustments in energy levels in the hydrogen atom, which correspond to actual spectral effects, may be determined by using a full quantum mechanical theory which corrects for the effects of special relativity (see Dirac equation), and by accounting for quantum effects arising from production of virtual particles in the vacuum and as a result of electric fields (see quantum electrodynamics). In hydrogen gas, the electronic ground state energy level is split into hyperfine structure levels because of magnetic effects of the quantum mechanical spin of the electron and proton. The energy of the atom when the proton and electron spins are aligned is higher than when they are not aligned. The transition between these two states can occur through emission of a photon through a magnetic dipole transition. Radio telescopes can detect the radiation produced in this process, which is used to map the distribution of hydrogen in the galaxy. Hydrogen has three naturally occurring isotopes, denoted 1H, 2H, and 3H. Other, highly unstable nuclei (4H to 7H) have been synthesized in the laboratory but not observed in nature. 2H, the other stable hydrogen isotope, is known as deuterium and contains one proton and one neutron in its nucleus. Deuterium comprises 0.0026–0.0184% of all hydrogen on Earth. It is not radioactive, and does not represent a significant toxicity hazard. Water enriched in molecules that include deuterium instead of normal hydrogen is called heavy water. Deuterium and its compounds are used as a non-radioactive label in chemical experiments and in solvents for 1H- NMR spectroscopy. Heavy water is used as a neutron moderator and coolant for nuclear reactors. 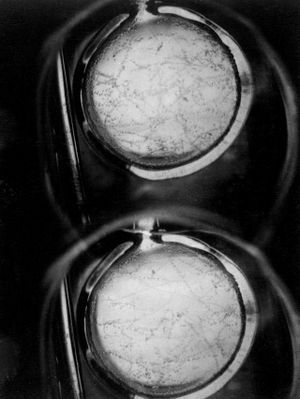 Deuterium is also a potential fuel for commercial nuclear fusion. 3H is known as tritium and contains one proton and two neutrons in its nucleus. It is radioactive, decays through beta decay with a half-life of 12.32 years. Small amounts of tritium occur naturally because of the interaction of cosmic rays with atmospheric gases; tritium has also been released during nuclear weapons tests. It is used in nuclear fusion reactions, as a tracer in isotope geochemistry, and specialized in self-powered lighting devices. Tritium was once routinely used in chemical and biological labeling experiments as a radiolabel (this has become less common). Hydrogen is the only element that has different names for its isotopes in common use today. (During the early study of radioactivity, various heavy radioactive isotopes were given names, but such names are no longer used). The symbols D and T (instead of 2H and 3H) are sometimes used for deuterium and tritium, but the corresponding symbol P is already in use for phosphorus and thus is not available for protium. IUPAC states that while this use is common it is not preferred. There are two different types of diatomic hydrogen molecules that differ by the relative spin of their nuclei. In the orthohydrogen form, the spins of the two protons are parallel and form a triplet state; in the parahydrogen form the spins are antiparallel and form a singlet. At standard temperature and pressure, hydrogen gas contains about 25% of the para form and 75% of the ortho form, also known as the "normal form". The equilibrium ratio of orthohydrogen to parahydrogen depends on temperature, but since the ortho form is an excited state and has a higher energy than the para form, it is unstable and cannot be purified. At very low temperatures, the equilibrium state is composed almost exclusively of the para form. The physical properties of pure parahydrogen differ slightly from those of the normal form. The ortho/para distinction also occurs in other hydrogen-containing molecules or functional groups, such as water and methylene. The uncatalyzed interconversion between para and ortho H2 increases with increasing temperature; thus rapidly condensed H2 contains large quantities of the high-energy ortho form that convert to the para form very slowly. The ortho/para ratio in condensed H2 is an important consideration in the preparation and storage of liquid hydrogen: the conversion from ortho to para is exothermic and produces enough heat to evaporate the hydrogen liquid, leading to loss of the liquefied material. Catalysts for the ortho-para interconversion, such as iron compounds, are used during hydrogen cooling. The solubility and adsorption characteristics of hydrogen with various metals are very important in metallurgy (as many metals can suffer hydrogen embrittlement) and in developing safe ways to store it for use as a fuel. Hydrogen is highly soluble in many compounds composed of rare earth metals and transition metals and can be dissolved in both crystalline and amorphous metals. Hydrogen solubility in metals is influenced by local distortions or impurities in the metal crystal lattice. Hydrogen gas is highly flammable and will burn at concentrations as low as 4% H2 in air. The enthalpy of combustion for hydrogen is –286 kJ/mol; it combusts according to the following balanced equation. When mixed with oxygen across a wide range of proportions, hydrogen explodes upon ignition. Hydrogen burns violently in air. Hydrogen-oxygen flames are nearly invisible to the naked eye, as illustrated by the faintness of flame from the main Space Shuttle engines (as opposed to the easily visible flames from the shuttle boosters). Thus it is difficult to visually detect if a hydrogen leak is burning. The Hindenburg zeppelin flames seen in the adjacent picture are from the covering skin of the zeppelin which contained carbon and pyrophoric aluminium powder that may have started the fire. Another characteristic of hydrogen fires is that the flames tend to ascend rapidly with the gas in air, causing less damage than hydrocarbon fires. Two-thirds of the Hindenburg passengers survived and deaths were from falling or from gasoline burns. H2 reacts directly with other oxidizing elements. A violent and spontaneous reaction can occur at room temperature with chlorine and fluorine, forming the corresponding hydrogen halides, hydrogen chloride and hydrogen fluoride. While H2 is not very reactive under standard conditions, it does form compounds with most elements. Millions of hydrocarbons are known, but they are not formed by the direct reaction of elementary hydrogen and carbon. Hydrogen can form compounds with elements that are more electronegative, such as halogens (e.g., F, Cl, Br, I) and chalcogens (O, S, Se); in these compounds hydrogen takes on a partial positive charge. When bonded to fluorine, oxygen, or nitrogen, hydrogen can participate in a form of strong noncovalent bonding called hydrogen bonding, which is critical to the stability of many biological molecules. Hydrogen also forms compounds with less electronegative elements, such as the metals and metalloids, in which it takes on a partial negative charge. These compounds are often known as hydrides. Hydrogen forms a vast array of compounds with carbon. Because of their general association with living things, these compounds came to be called organic compounds; the study of their properties is known as organic chemistry and their study in the context of living organisms is known as biochemistry. By some definitions, "organic" compounds are only required to contain carbon (as a classic historical example, urea). However, most of them also contain hydrogen, and since it is the carbon-hydrogen bond which gives this class of compounds most of its particular chemical characteristics, carbon-hydrogen bonds are required in some definitions of the word "organic" in chemistry. (This latter definition is not perfect, however, as in this definition urea would not be included as an organic compound). Compounds of hydrogen are often called hydrides, a term that is used fairly loosely. To chemists, the term "hydride" usually implies that the H atom has acquired a negative or anionic character, denoted H−. The existence of the hydride anion, suggested by G.N. Lewis in 1916 for group I and II salt-like hydrides, was demonstated by Moers in 1920 with the electrolysis of molten lithium hydride (LiH), that produced a stoichiometric quantity of hydrogen at the anode. For hydrides other than group I and II metals, the term is quite misleading, considering the low electronegativity of hydrogen. An exception in group II hydrides is BeH2, which is polymeric. In lithium aluminium hydride, the AlH4− anion carries hydridic centers firmly attached to the Al(III). Although hydrides can be formed with almost all main-group elements, the number and combination of possible compounds varies widely; for example, there are over 100 binary borane hydrides known, but only one binary aluminium hydride. Binary indium hydride has not yet been identified, although larger complexes exist. Oxidation of H2 formally gives the proton, H+. This species is central to discussion of acids, though the term proton is used loosely to refer to positively charged or cationic hydrogen, denoted H+. A bare proton H+ cannot exist in solution because of its strong tendency to attach itself to atoms or molecules with electrons. To avoid the convenient fiction of the naked "solvated proton" in solution, acidic aqueous solutions are sometimes considered to contain the hydronium ion (H3O+) organized into clusters to form H9O4+. Other oxonium ions are found when water is in solution with other solvents. Although exotic on earth, one of the most common ions in the universe is the H3+ ion, known as protonated molecular hydrogen or the triatomic hydrogen cation. In the laboratory, H2 is usually prepared by the reaction of acids on metals such as zinc. Hydrogen can be prepared in several different ways but the economically most important processes involve removal of hydrogen from hydrocarbons. Commercial bulk hydrogen is usually produced by the steam reforming of natural gas. At high temperatures (700–1100 °C; 1,300–2,000 °F), steam (water vapor) reacts with methane to yield carbon monoxide and H2. Consequently, steam reforming typically employs an excess of H2O. NB. Hydrogen is sometimes produced and consumed in the same industrial process, without being separated. In the Haber process for the production of ammonia (the world's fifth most produced industrial compound), hydrogen is generated from natural gas. H2 is a product of some types of anaerobic metabolism and is produced by several microorganisms, usually via reactions catalyzed by iron- or nickel-containing enzymes called hydrogenases. These enzymes catalyze the reversible redox reaction between H2 and its component two protons and two electrons. Evolution of hydrogen gas occurs in the transfer of reducing equivalents produced during pyruvate fermentation to water. Water splitting, in which water is decomposed into its component protons, electrons, and oxygen, occurs in the light reactions in all photosynthetic organisms. Some such organisms — including the alga Chlamydomonas reinhardtii and cyanobacteria — have evolved a second step in the dark reactions in which protons and electrons are reduced to form H2 gas by specialized hydrogenases in the chloroplast. Efforts have been undertaken to genetically modify cyanobacterial hydrogenases to efficiently synthesize H2 gas even in the presence of oxygen. Other rarer but mechanistically interesting routes to H2 production also exist in nature. Nitrogenase produces approximately one equivalent of H2 for each equivalent of N2 reduced to ammonia. Some phosphatases reduce phosphite to H2. Apart from its use as a reactant, H2 has wide applications in physics and engineering. It is used as a shielding gas in welding methods such as atomic hydrogen welding. H2 is used as the rotor coolant in electrical generators at power stations, because it has the highest thermal conductivity of any gas. Liquid H2 is used in cryogenic research, including superconductivity studies. Since H2 is lighter than air, having a little more than 1/15th of the density of air, it was once widely used as a lifting agent in balloons and airships. However, this use was curtailed after the Hindenburg disaster convinced the public that the gas was too dangerous for this purpose. The triple point temperature of equilibrium hydrogen is a defining fixed point on the ITS-90 temperature scale. Having been used as an ingredient in some rocket fuels for several decades, hydrogen, or more specifically H2, is now widely discussed in the context of energy. Hydrogen is not an energy source, since it is not an abundant natural resource and more energy is used to produce it than can be ultimately extracted from it. However, it could become useful as a carrier of energy, as elucidated in the United States Department of Energy's 2003 report, "Among the various alternative energy strategies, building an energy infrastructure that uses hydrogen — the third most abundant element on the earth's surface — as the primary carrier that connects a host of energy sources to diverse end uses may enable a secure and clean energy future for the Nation." The hydrogen would then locally be converted into usable energy either via combustion of fossil fuels or by electrochemical conversion into electricity in a fuel cell. One theoretical advantage of using H2 as a carrier is the localization and concentration of environmentally unwelcome aspects of hydrogen manufacture. For example, CO2 sequestration could be conducted at the point of H2 production from methane. Hydrogen could also be produced using the electrolysis of water method; however, this is currently three to six times as expensive as production from natural gas. High-temperature electrolysis, which promises greater efficiency, is being investigated. Currently, however hydrogen production is expensive relative to other energy storage chemicals, and the bulk of hydrogen is now produced by the least expensive method, which (as noted) employs methane and which, as currently practiced, creates greenhouse gas emissions.